Well after a day in the north it was good to get back to some plain and simple local birding. Nothing complicated; an obliging Lesser Scaup, a potential County year tick in the shape of a Red breasted Merganser and who knows what flying through on easterly winds in October. 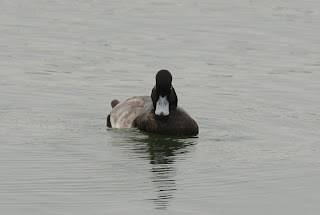 I met up with Dave Hutton at Draycote and we had a pleasant 20 minutes with the Lesser Scaup at close range in Toft. The fishing boats clustered around each other like a herd of sheep around a bale of hay. It did have the effect of pushing the Tufted duck flock nearer the shore though and into the range of my 400mm lens. After 20 mins or so I left Dave to it and went in such of the Merganser. Despite a stroll to the Valve tower the search was in vain. The walk back to the car was equally fruitless but a flock of eight Meadow pipits was noted on Toft Bank. I'd just bought a coffee when the pager said there were 3 Twite seen on Toft bank about an hour earlier. I met Terry Southgate and Mo, Terry reckoned he seen the birds and took me round to Toft but despite a thorough check there were no finches to be seen. I met up with Kevin Groocock on my 3rd search of Toft bank. As we walked back 3 birds flew overhead and landed on the rocks amongst some yellow flowers. They were tucked in under the concrete wall and quite distant. From the views we got they looked good for Twite. 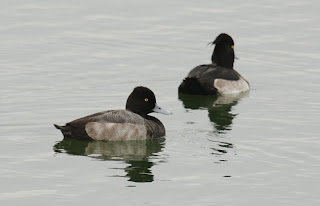 A rich brown colour, strong black streaks down the back and stumpy yellow bill. I managed to get some distant grab shots. The birds then flew and we agreed that they sounded like Linnets. We met Dave Hutton and Richard Mays who described similar sightings, we all agreed that the call was the decisive factor and that the birds were almost certainly Linnets. 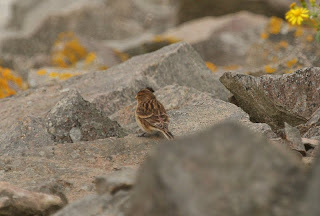 However, when I looked at the photos I' d managed to get I was pretty sure I was looking at a Twite. Also a characteristic "pinky" rump? I am sold on Twite. It could be possible that this was a Twite with two Linnets.THis would explain the Linnet call we heard on departure. It all fits. I am sure, as I said, that I heard a "twa-eeet" call as they went over. Looks like a number of birders will be out searching today. Nice pic for a "grab".